Quality-made, sturdy and in vibrant RED & BLACK, the punching bag and the boxing gloves will introduce your little angel into active play. Keep Your Little One Fit, Active & Happy! ALL YOUR LITTLE BOXER NEEDS IN ONE BOX! The weighted stand with the elastic spring can be adjusted to 80 to 110 cm (30" - 43") depending on your kid's needs. 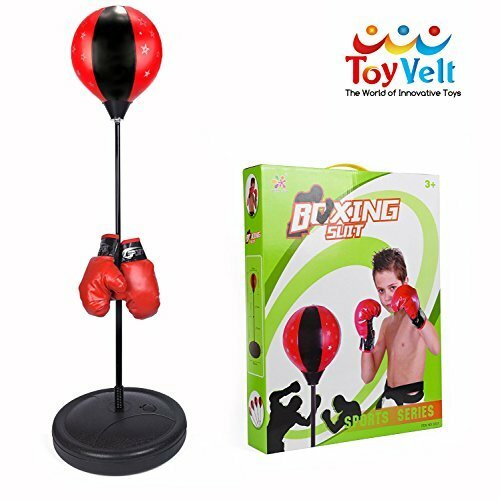 The stitched punching bag can be inflated in no time, while the quality-made boxing gloves are sturdy enough to withstand wear and tear in the hands of little boxers.